As some of you may or may not know, I am not from around Pittsburgh but instead in the northeastern sector of Pennsylvania. While living here certainly has its ups and downs, I must say as a sports fan one of the greatest joys is being able to see the future stars of your team before they become famous. 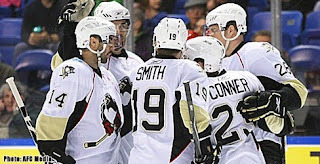 Yes, I am talking about the Wilkes-Barre/Scranton Penguins, Pittsburgh's AHL affiliate. I bring this up now because Friday night they clinched a spot in the AHL Playoffs Friday night with a 4-3 win over the Albany River Rats. Though AHL hockey is often considered to be less important than that of the NHL, I must counter that saying that these men want the ultimate prize (Calder Cup) just as much as their NHL counterparts. Next week the Pens embark on the road to the Calder Cup, and I will update every step of the way. The Penguins will have either the Albany River Rats or the league leading Hershey Bears in the first round, and they can avoid Hershey if they manage to win their final games of the season. There you have it folks, both NHL and AHL playoff mania next week for the Pens. Lets Go Pens! Thanks for the updates! It would be pretty cool to catch a Baby Pens game at some point, I hope I can one day. By the way, who are the goalies for the playoff run?